The 'Britain Prepared' series of 24 postcards was issued during World War I, in 1916 I think, with permission of the Admiralty and under the patronage of the King and Queen. Most of the cards show HMS AFRICA of the 'King Edward VII' Class and/or the brand new HMS QUEEN ELIZABETH. I have no idea how these ships were chosen but they seem a strange combination! These cards do not scan very well and viewing in 'Large' format is recommended. These pictures are published for pleasure/information/research purposes only and are not for sale or copy under any circumstances. Information in captions has been researched as thoroughly as possible but it accuracy cannot be guaranteed. 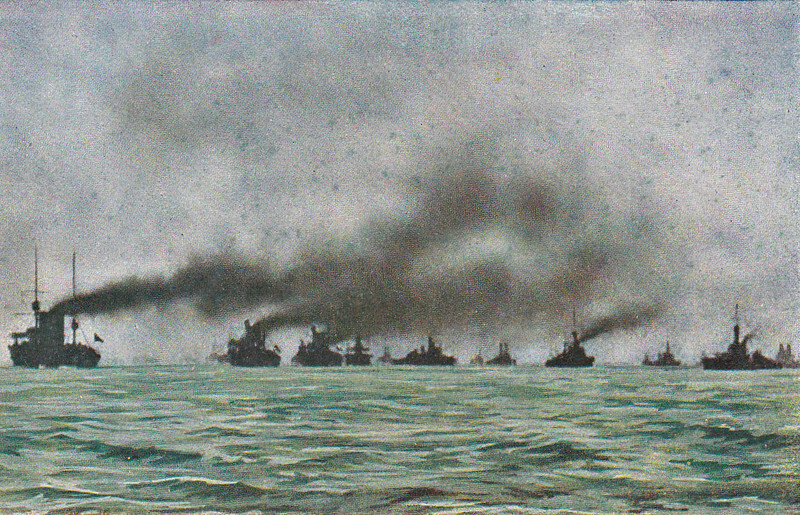 1 - THE GRAND FLEET UNDER WAY - Most of the ships in this picture seem to pre-Dreadnoughts although the ship on the extreme right is certainly a Dreadnought - posted June 15th, 1916.